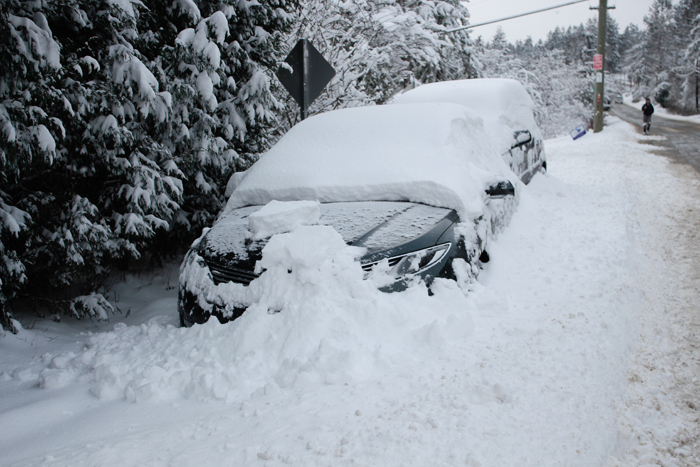 Cars along Fulford Ganges Road were buried with snow on Monday morning. The Gulf Islands’ first blast of winter on Friday was followed up with a major snowfall Sunday as the “coldest and snowiest pattern in a decade” got underway. Some areas of the coast saw 30 centimetres or more of snow accumulate over the weekend, causing school districts in the Gulf Islands, Victoria and Surrey to close all schools on Monday. The poor road conditions on Salt Spring Monday morning resulted in the cancellation of the early morning ferry sailings between Fulford Harbour and Swartz Bay as crew members were unable to reach the Fulford terminal. Mainroad Contracting crews were concentrating on clearing roads to ferries first and hoped to move on the secondary roads after that. Environment Canada warned this may be just the beginning of an extended week of exceptionally bad weather. The agency was calling for another 10 to 15 cm over Monday night/Tuesday morning with a second low pressure system in two days expected to sweep through the region. The white-out conditions and quickly accumulating snow caused travel havoc for many. Salt Spring Fire Rescue warned drivers to stay off the road after the snow started Sunday afternoon, reporting one roll-over accident had already occurred. Bus service was restricted to main roads only. By the evening, cars were stuck on Fulford-Ganges Road at Lee’s Hill, partially blocking the travel lanes. Heavy snowfall also impacted ferry passengers travelling on Sunday afternoon and evening, when the RCMP closed Highway 17 in both directions between Swartz Bay and Keating Cross Road following several major car crashes. People arriving at the terminal from Vancouver and the Gulf Islands were forced to stay put in the arrivals area for several hours before the road was re-opened. The Malahat highway was also closed between Langford and Shawnigan-Mill Bay Road due to dangerous road conditions. Ferries running off schedule on Sunday afternoon and evening included the Skeena Queen, which was held to wait for passengers transferring from the Spirit of British Columbia, the Howe Sound Queen, the Klitsa serving Brentwood-Mill Bay and the Chemainus-Penelakut-Thetis ferry. Snow and high winds that started Friday and accrued through Saturday morning resulted in power outages for almost all residents on Mayne, Pender and Saturna Islands through Saturday and into Sunday. Multiple Salt Spring residents also lost power for a short time on Friday night or Saturday morning.